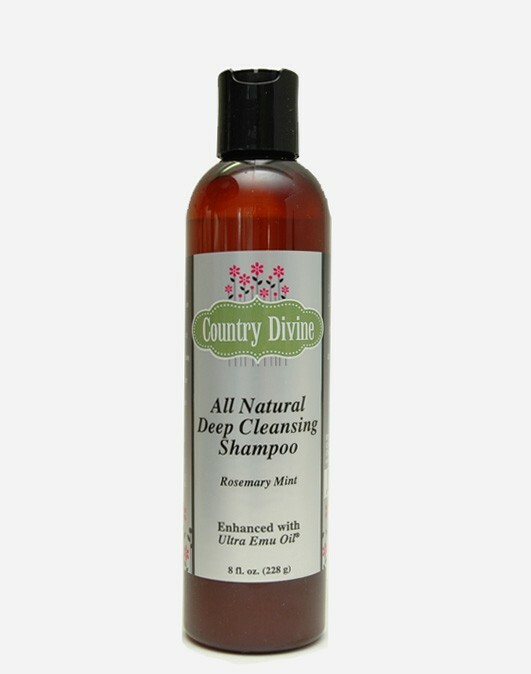 Country Divine's pure, gentle, daily shampoo---with Ultra Emu Oil---cleanses, softens and fortifies any type of hair; infusing it with nature’s perfect moisturizer to reduce frizz. This new formula penetrates hair to deliver lasting, intense moisture so hair looks fuller, feels thicker and stays more abundant. Pure Emu Oil contains one of the world’s richest concentrations of essential fatty acids, such as Omegas 3, 6, and 9, which replenish moisture in the hair and scalp and adds strength and body to the hair. These essential fatty acids penetrate deep into the scalp, hair shaft and root to moisturize and hydrate. Properties of Emu Oil soothe the scalp. Paraben Free, Gluten Free and SLS Free. Wash away dirt and oil with Country Divine's nourishing All Natural Deep Cleansing Emu Oil Shampoo. Specifically formulated to cleanse the hair while restoring shine and manageability. It has a rich lather that rinses clean for ultra-performance. This new formula is faster absorbing and leaves no sticky feeling. Made from some of the most natural and gentle ingredients, this Ultra Premium Shampoo does not compromise on quality. Enhanced with Ultra Emu Oil™ to give your hair the healthiest look and feel possible. Country Divine All Natural Deep Cleansing Emu Oil Shampoo ensures that users with even the most sensitive skin and hair are able to benefit from this all natural hair care product. Country Divine's all natural Emu Oil Hair Care Products are made with nature's finest ingredients for healthier, manageable hair. The deep cleansing shampoo and rejuvenating conditioner are made with the highest quality Ultra Emu Oil® to penetrate hair and deliver lasting, intense moisture so hair looks fuller, feels thicker and stays more abundant. Country Divine's hair care products naturally include essential fatty acids, omegas 3, 6, and 9, which replenish dry or damaged hair and restore hair's natural shine. Take advantage of the benefits of Emu Oil for your hair today. Available in Rosemary Mint.